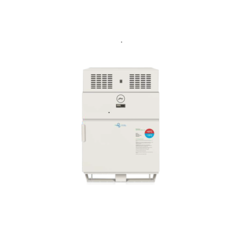 Water, not ice, surrounds a Sure Chill refrigeration compartment. Sure Chill technology limits the temperature variation in the cabinet to less than 1°C. Sure Chill is a brand new kind of cooling system. It doesn't need a constant power source. In an on-grid situation with intermittent power, it works perfectly well. In an off-grid situation, a solar panel may be used. According to UNICEF, over half the vaccines in the world are affected due to improper storage and cooling. Vaccines require to be stored an optimal temperature of 4 degree Celsius, from the time of manufacturing to administering them. Next to actually creating the vaccines, storing them safely is the hardest task. .